Last month, Apple released iOS 12.2 in beta with several new features, including the Apple News app in Canada, a redesigned TV remote in Control Center, support for adding HomeKit-enabled TVs in the Home app, and more. The upcoming software update also introduces a new Motion & Orientation Access toggle under Settings > Safari > Privacy & Security. Toggled off by default, this new setting must be turned on in order for websites to display features that rely on motion data from the gyroscope and accelerometer in the iPhone, iPad, and iPod touch. 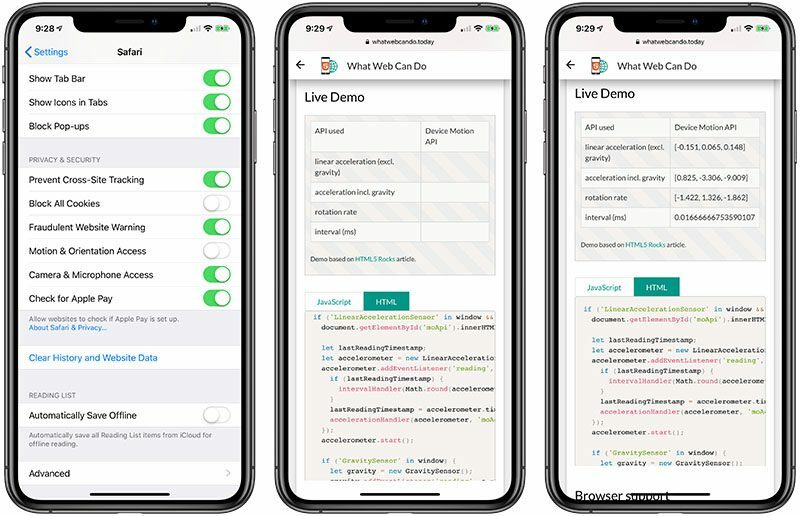 To test this, we loaded the What Web Can Do Today website on an iPhone running the first beta of iOS 12.2. With the Motion & Orientation Access setting toggled on, the page shows real-time accelerometer and gyroscope data from the iPhone. With the setting toggled off, no motion data is shown. Another example is Apple's motion-based iPhone experience site. 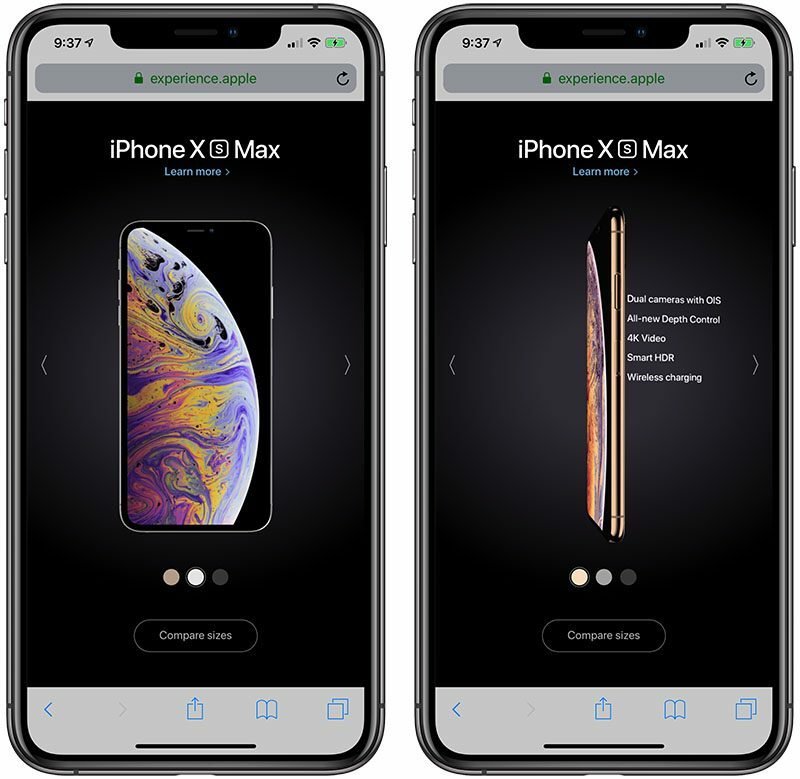 This page normally allows you to tilt your actual iPhone to swivel the iPhone XS Max on the screen with tech specs. With Motion & Orientation Access toggled off, however, only a static image of the iPhone XS Max is shown without tech specs. This privacy-focused change could be in response to a WIRED report last year that claimed thousands of websites have unmitigated access to motion, orientation, proximity, and light sensor data on mobile devices. Software engineer Felix Krause also filed a radar and notified Apple's security team about this matter in 2017. For example, Samsung's "Samsung Within" web-based interactive experience, developed by R/GA to promote the hardware brand's legacy and its Galaxy Note 9 phone, uses the accelerometer to let people explore the night sky. "It's definitely going to break things," said Kai Tier, executive technology director at R/GA. These AR/VR experiences may have to rely on fallback versions that people can navigate with swipe gestures instead, but this largely defeats the purpose of motion-based, interactive campaigns. It's quite possible Apple could tweak how this feature works in time for the public release of iOS 12.2. Perhaps the setting will be toggled on by default in a subsequent beta, for example, or Safari could prompt users for permission to access motion data when necessary as it does with location data. Not sure how much this would preserve privacy, but at the same time I can't imagine accelerometer data is very largely used in mobile web dev in the first place. Sounds more just like security theatre being put on by Apple, but if anyone out there knows something I don't, by all means feel free to enlighten me. So this seems like it could be a potential threat to privacy and the security of your personal information. Albeit a very small one. One can hope that a pop-up appears when a website requires gyroscope access. Without one, and the setting off by default, many consumers would be at loss since most wouldn’t know how to turn it on. This article seems to be misleading. It doesn't seem to me that Apple is limiting access; it seems to just be making that feature "opt in" rather than "opt out". I think there's some potential for collected accelerometer/gyroscope data to be exploited with respect to creating motion/location profiles of a phone user. It depends on the accuracy and drift of the sensors, time references, signal processing techniques employed, required accuracy, etc. I wouldn't be shocked if a very clever individual/company could create something interesting of value (ie, sellable processed user information) from collected raw sensor data. I'm glad Apple is thinking ahead with respect to the possibilities and privacy implications. It’s legitimate, there are algorithms to figure out your keystrokes based on gyro and accelerometer data. MIT demo’d it a few years ago IIRC. Interesting. The limitations to interactive ad or experiential campaigns would be frustrating for many companies that have things in the works. But this would provide another potential opportunity for Apple, which they really should look into: an internally-hosted and -approved ad platform. Apple should offer a way to have interactive ads that rely on iOS device information to the company for review and eventual hosting once approved. This way, they keep control of where that data goes (I think many trust Apple more than any other company to keep the data secure and only used for the purpose of displaying the experience), and Apple can take a reasonable fee for the privacy and availability of such a service that it hosts, adding another service-based revenue stream. It's a good way to capitalize on its user base without "selling" its customer information... Instead, they're just getting paid to be a watchdog over your private device metrics to let you experience more types of media online worry-free. They had that. It was called iAd and it was a major flop. Good. More privacy is better. Is knowing which direction my phone is facing really an invasion of my privacy? Glad this is something that is off by default. Since most people wouldn't even be aware of it and leave it on. Not due to preference. Just because they don't know any better. I know it sounds like nothing. Accessing motion and orientation data. If someone can use it. Someone will figure out a way to abuse it.